LOCATION, LOCATION! Come visit beautiful Niagara and stay in the heart of the region. Centrally located, the house has 4 proper bedrooms & one very comfortable pull-out, 2 bath, 2 kitchens with lots of room to spread out. Long, paved driveway with parking for up to 4 vehicles. Minutes drive to Brock U or Niagara College and just over an hour to Toronto. View the escarpement from the living room. 5 min drive to the cellar bench wine region (Hernder's, Henry of Pelham) and Club Roma. 15-20 minutes to NOTL wineries. Neighbourhood is surrounded by biking trails, the Pen Centre Mall and has a designer outlet mall just down the street. 5 minutes to First Ontario Performing Art Centre, Meridian Arena, Ridley College and a short drive to most major tourist attractions and wedding venues in the area. Dine at one of the wineries, hike the Bruce Trail on the Escarpment (few minutes walk away), or the Short Hills Park (5 min drive), drive through the countryside and pick up fresh produce at a roadside stand, or visit one of the wonders of the world and try your luck at the casino. (only a 15 min drive to Niagara Falls and Niagara-On-The-Lake!). Separate in-law suite can be used for private area if desired or as a private sleeping area.Tourist info on the area can be provided upon request. NOTE: A Property Manager is available for any issues/queries you may have during your stay. Monthly stays discounted. Professional cleaners and property/maintenance personal are readily available to ensure guests have the best stay possible. I am a user of home vacation properties all over the world and appreciate living among the locals for an authentic travel experience I am a native Niagara resident. I also use my home for family and friends so it is equipped with all you need. I knows many hidden gems of the area and, if interested, I can arrange provide you a suggested itinerary or arrange tours during your stay. Family home equipped with all you need. 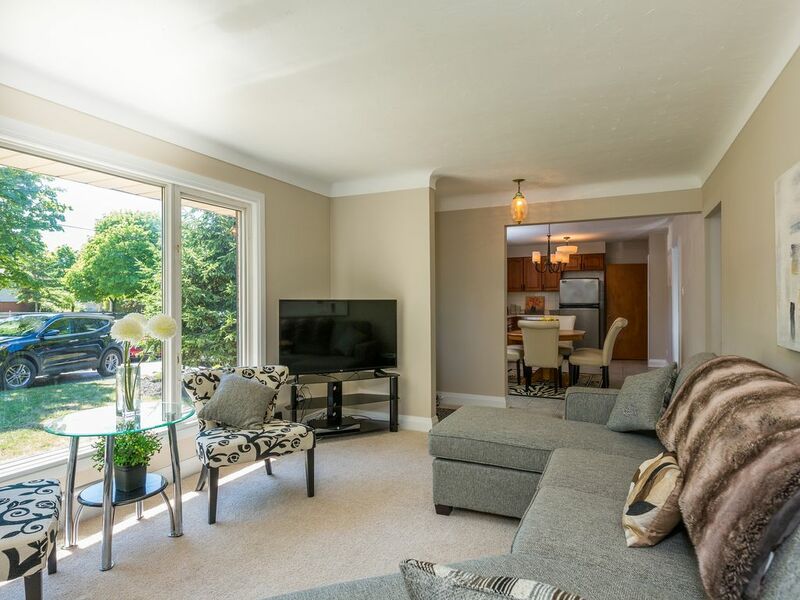 Enjoy all that the Niagara Regions offers and come home to a relaxing house close to everything. Just make yourself at home! Relax on the patio or the deck after a day out and have a BBQ. Or cozy up in front of a large flat screen tv and enjoy a movie after making dinner in a large kitchen full of light or a game of air hockey or pool in the family room. Rural St. Catharines and wine region is a 5-10 min drive west. Available for stays longer than 5 nights only. Large garage - good for bicycle storage etc. Towels and cloths for 9 provided. Two Kitchens - Large eat in kitchen with microwave, dishwasher, stainless steel appliances. Second kitchen in basement with fridge/toaster oven. High chair available upon request. In door and outdoor dining areas. Extra chairs on site. Very large private, fenced back yard. One bike available. Too many bike trails in area to mention! Canal Parkway 10 min bike ride away. 12 mile creek 5 minutes away. Wine tours and tours of the Niagara Region or Toronto can be arranged if requested. We had a fantastic mini break, the house was clean and tidy, in a good location for sight seeing. Would definitely recommend Lee if you are looking to tour Niagara and the winery region. We arrived a little early which was approved by the owner and much approved. Our stay was very comfortable. The location was perfect and the house very well appointed. Plenty of room for our family with all the necessities in the home. The ability to have us all stay together in such a comfortable environment was very much appreciated! Thank you for sharing your home! We had a wonderful time. The house provided everything and more. Great stay. Perfect for my family. While close to all the conveniences also close to the countryside and wine country. House was quiet, very clean and easily accessible due to key less entry. Highly recommend it. We will be back in the Summer! The house was very clean and comfortable. It was even decorated for the season. We enjoyed our stayed very much. Great location and everything we needed! We came to St Catharines for a wedding at the Stone Mill Inn. Couldn’t have asked for a more convenient location! We ended up only being 3, but Lee’s place could easily and comfortably sleep 9! Check in was easy, shower pressure was fantastic and it was a very comfortable place to relax between wedding and reception with our family. Would definitely rent again! Located in the heart of the Niagara Region. Surrounded by both wine regions of Niagara on the Lake and the Cellar Bench, bike trails, welland canal and the Niagara Escarpment hiking trails. Within 15 drive to Niagara Falls, Niagara On the Lake, the Great Lakes of Erie and Ontario, Niagara River. 5 Minutes drive from Brock University, factory outlet mall, short hills national park. Within walking distance of largest area mall, cinemas, grocery stores. On direct bus route. For monthly or stays longer than 7 nights, please contact owner directly for pricing. (discounts available) If cancel less than 29 days before stay - 50% return of payment with the exception of the periods listed below. No refunds at any time May 18 - Sept 30th, December 22 - January 2 or statutory US and Canadian holiday weekends.